the ancient name of Ankara, Turkey, which has been given to particular breeds in several animal species probably originally to a longhaired cat that was believed to originate in Turkey, and later to the other species because of their long coat. a fine-boned, longhaired breed, originally found in Turkey. The build is generally slimmer and longer than other longhaired types. The silky coat is usually white, but other colors have been developed. Called also Turkish Angora. 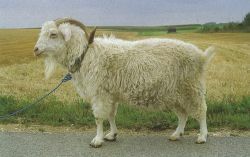 a horned, white variety of Capra hircus, the domestic and wild goats. Has a long silky haircoat of great commercial value as mohair. a breed of meat- and fur-producing rabbit in two varieties, English and French. A striking-looking animal like a fluffy snowball with long, silky wool with tufts on the ears and feet. Color usually white but can be fawn, gray-blue or sable and with ruby-colored eyes. A Nigora with Type A fiber will most likely need to be shorn twice a year, like an Angora, while an A/B or B type will only need to be shorn once. Two women who are determined to talk up its merits are Dorothy Dyson and Alison Hulley, who set up Snowdon Angora to market this finest of wools. Raising Angoras in a colder climate, we monitor late-term does carefully so we can be there to dry off the kids and place them under a heat lamp in a stall with their mother. The total number of detectable alleles in the fourteen studied loci was 105 and 123 for Australian Angora and Cashmere goats, whereas it was 137, 127, and 120 for Mongolian GGS, ZB and BD populations, respectively (Tables 2 and 3). A spokeswoman for Suffolk police said last night: "A tortoiseshell Turkish Angora cat was taken on Monday at 10. It had been thought that Turkish Angoras had been wiped out through breeding with Persian cats. The wool from an Angora goat or rabbit is very soft and fine. Because of this unique characteristic, Angoras require higher quality forage if they are thrive. Angoras will try to groom themselves because of discomfort, which could cause wool block because they swallow their fur. ANGORA goats, prized for their luxurious fleeces, will be among the animals popular as income generators for smallholders on show at this year's Royal Welsh Smallholder and Garden Festival in May. However in my hunt to find Nigoras, I did find a few Angora does for sale and so I decided to just make my own Nigoras. Her dream is to re-establish a wool mill on the island, handling not just angora but also sheep's wool. ANGLESEY SHOW: Tales from the show . .